Hoping to score a deal on a new smartphone on Black Friday? Before switching to a new phone, move tickets purchased with the TriMet Tickets mobile app from the phone to the online account as a precaution. After mobile tickets are purchased, they are stored in the app on the phone, which allows them to be used without requiring an Internet connection. When changing phones, users could experience an issue where apps, such as the TriMet Tickets app, could accidentally be deleted. As a precaution, before shutting off the network connection to the old phone, users should simply transfer mobile TriMet Tickets from the phone to the online account. It takes just a few simple steps. Login to your TriMet Tickets online account. Go to My Account, then to My Tickets and click the Recall Tickets button. On your old device, tap the My Tickets icon to refresh. You should see your tickets moved. When you get your new phone, or after updating the OS, open up your TriMet Tickets app. Go to the My Tickets tab and refresh to download your tickets. We recently added the ability to recall or move active multi-day tickets and passes—such as a 7-Day, 14-Day and 30-Day —from a phone to an online account and back again. In the past, only unused tickets could be moved. Active tickets can only be transferred to the account and back to the phone one time. If any user experiences problems when switching phones or performing an upgrade, they should contact the TriMet Tickets Help Desk at mobiletickethelp@trimet.org. Since TriMet launched the TriMet Tickets mobile app on September 4, 2013, becoming the first transit agency in the U.S. to implement a mobile ticket for use on both buses and trains, the mobile app has been downloaded more than 152,000 times. More than 2.6 million mobile tickets have been purchased. 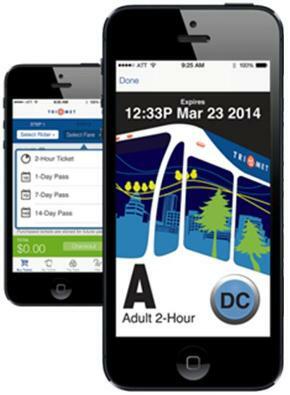 With the free app, riders can purchase tickets anywhere, at anytime right on their smartphone. It’s quick and easy. Learn more about the TriMet Tickets mobile app at trimet.org/mobiletickets.